When we are talking about the Chile 50 Peso Liberty gold coin, we are referring to a gold coin graded as uncirculated that has not experienced continuous minting. It was minted first in 1926 when the mintage accumulated 126,000 gold coins and ended being minted in 1973, the following years experiencing scarcer mintages. The Chile 50 Peso Liberty gold coin weighs 10.1698 grams in total and the gold content is of 9.15 grams which is the equivalent of 0.2943 troy ounces of pure gold. It has a diameter of 24 mm and a high purity of 90.00% which makes it a great choice for investors and collectors. In 1926, the first in which was minted, the Chile 50 Peso Liberty gold coin became a modern coin which presents a great interest for investors experienced or not since the price of gold has increased and everyone is seeking to benefit from premiums. Chile, a country with rich reserves of gold, issued a variety of gold coins. The other two denominations, except the Chile 50 Peso Liberty gold coin, in which the Peso gold coins were issued, are the 100 and the 20 Chile Liberty gold coins. One of their common characteristics is their design depicted on the obverse and reverse of these Chilean gold coins. The obverse features the head of a woman dressed in a Chilean dress, facing left. The head is laureate and above it, at the top of the coin, it is the inscription REPUBLICA DE CHILE. 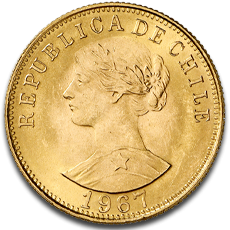 At the bottom of the Chile 50 Peso Liberty gold coin it is inscribed the year 1967 in which was minted the Chilean Peso gold coin. The reverse illustrates a Chilean shield surmounted by feathers having a star in the center, representing the Coat of Arms of Chile. This shield found on the gold coin is accompanied by two animals both with crowns on their head. The inscription of the reverse reads as follows 50 PS CINCUENTA PESOS CINCO CONDORES. For a historian or a person passionate by history it could be interesting to own a Chile 50 Peso Liberty gold coin if we were to take into consideration that it is the gold for which Spain desired to conquer Chile. Thanks to its gold reserves, Chile posed a great interest for Spain. So, by owning a Chile 50 Peso Liberty gold coin it would like owning a piece of the highly wanted asset by the powerful Spanish government. In those times, countries were fighting each other in order to get hold of gold reserves. Nowadays, investors and ordinary people are turning to gold as a safe mean to remain financial stable and as a safe way to gain prosperity and the Chile 50 Peso Liberty gold coin can and is traded with these well thought financial intentions. Also, the Chile 50 Peso Liberty gold coin is highly desired by worldwide collectors. This Chilean 50 Peso gold coin is also available on our website just like any other coin that anyone is interested in. We offer competitive price and, of course, the gold coins are free of VAT. So, if you want to trade the Chile 50 Peso Liberty gold coin, visit our website, we are ready to receive our potential and future customers.